Readers of this blog might have noticed that I am a big fan of minimalistic filmmaking. I have tremendous respect for those who seek to create much out of little, and purposely limit their resources. Films like Cube, Death and the Maiden, and 3-Iron are examples of how filmmakers have managed to tell amazing stories with very few actors, little action and very litte, if any, dialogue. 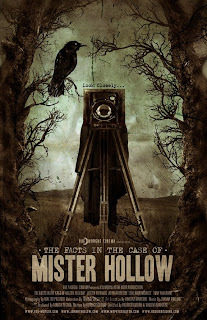 But in The Facts in the Case of Mister Hollow, director Rodrigo Gudiño has taken it to the next level, by basically removing all movement, and reducing his film to a still photograph. It features no dialogue and lasts for about 5 minutes. Now you might think that staring at the same photograph for that time will quickly get boring, but that's where the director's ingenuity comes to show. The film keeps you on edge every second and will even make you want to watch it again and again. Inspired by the photo analysis machine in Blade Runner, the camera floats around the photograph, constantly revealing new details that hints at a sinister story behind the picture, but leaves it up to you to draw the final conclusion about what the film is about. The brilliant soundtrack doesn't hurt either. All right... that was amazing. So much detail, and a fine example of first impressions never being correct.